One year on. Another new journey. One year ago today I arrived in JFK airport in New York at the beginning of my cycle across the United States. At that point the road ahead was long – 3600 miles long. I wrote about the little things being big. That the little steps you take day by day are the ones that get you there. One year on, I am at the beginning of another journey. The road ahead is about 92 weeks long and there is a General Election at the end. In May, I came back to my home in Cardiff and was proud to be selected by Labour members as their Parliamentary Candidate. 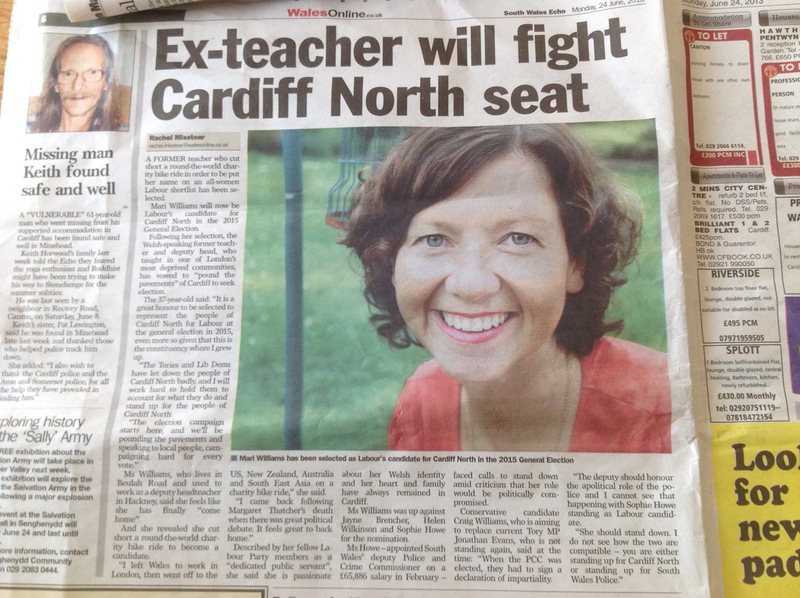 Now begins our campaign to win my home constituency – Cardiff North – back for Labour. I joined the Party when I was 17, angered by Thatcher’s disregard for ordinary working people. Particularly in the communities of South Wales. After two years in the private sector and over ten in the classroom in inner city schools I have an experience which so many people say they want in their politicians. People who have worked outside of politics. I get street cred, respect and interest when I say I am a teacher. Teaching is a hard job but it also brings huge rewards and thankfully now the profession has good standing amongst the general population. And then I became a Labour Parliamentary candidate, in the eyes of the population – a politician. I found it all quite depressing. It was as if he were saying ‘This is what you have become’. There are many local councillors in Cardiff North who prove their politics through their actions. They are out on the doorstep, involved in community organisations and follow up issues for local people. Julie Morgan our Assembly Member also shows through her hard work and campaigning that she puts into practice what she believes in. I had another stark introduction to being back in politics. The day after my selection, I was phoned by a journalist from one of the Welsh papers asking me if I would be working part time in Birmingham. I had been offered a job as a Deputy Head. Suddenly a decision about how I would make a living was a page 11 story. The headline including the phrase ‘In Brum Trouble’. I decided – not because of the article – but because of the time the job, and the commute, would take – as well as the commitment needed by the school – that I would not be able to take the part time post. I want to make sure I do everything I can to win Cardiff North back for Labour. There is an irony of wanting ordinary people to represent us but the role requiring a highly flexible work pattern. Suddenly I have to think differently. As I have found a lot in life. If your focus becomes what others think of you then the only way ahead is paranoia and a bees nest of uncertainty. I am a member of the Labour Party because I believe everyone deserves a fair chance in life. Because I believe that the family you are born into should not dictate your destiny. Because I believe that as a society everyone benefits from strong communities where the old are looked after and the young have opportunities. So in the face of cynicism having made a step into politics, I will continue to try to act according to my values and speak out for those who do not have a voice. I want to bring with my candidacy a way of doing things that engages more people in politics. I also believe, and have written about before, the importance of the small acts that demonstrate your values. The thank yous, the discipline of not judging others or being brave enough to give face to face negative feedback. In July I traveled to London for the night to watch my old school’s performance of Bugsy Malone. An incredible and professional performance that at points had me in tears. The talent and hard work of the staff and the students showed what is possible with vision and ambition. I thought about what a difference a great head teacher makes. But the picture is bigger. Without the right people in government you cannot achieve as much. When we look back at 1997 – 2010, it will I think be known as a golden age for schools. New buildings, more teaching assistants, smaller class sizes, investment in teacher training, higher salaries that delivered higher standards, better results and more young people staying on in further and higher education. Recent UCAS figures show young people from inner cities are more likely to go on to university. This is what investment can do. Last week there was good news on the UK economy. 0.6% growth is in the right direction. The same level of growth as took place in the last year of the UK Labour government. But living in Cardiff and talking to people on the doorstep, I know how people have been made redundant, had their pay frozen or fear for their jobs. With more Coalition cuts on the horizon: Cardiff Council will have to cut £90 million alone and our local hospital trust threatens 400 job losses. Last week I met a man who had not had a pay rise in 5 years – he ran his own business. He and his wife were also supporting her brother who had lost his job and was trying to live on £60 a week. Osbourne’s cuts mean people have little confidence that their financial position will improve in the months ahead. Low confidence means people don’t spend and the recovery is slow. Osbourne is hoping people will blame Labour in the Council and the Welsh Labour Government. I have more faith in the people of Cardiff North for understanding where the buck should stop. So exactly one year on from that American journey that did get me across the United States on my bike I am re-starting my blog. Promising to keep writing about the ups and the downs of the campaign and aiming to keep real life in my politics. If I don’t I’m sure you will be the first to tell me.